The study of the ethnic formation or assimilation of maritime peoples and immigrant groups is one way in which we can develop a better understanding of the paradoxical diversity and unity of the people of the Nusantara. The social organization of long established andless peripatetic rural people such as the Sundanese also gives answers about the identity of the Nusantara. Ethnic formation and group identity occurred in the context of interaction with other groups and foreigners. Trade and ethnic formation were thus closely interlinked. This interaction was particularly intense during the ‘Age of Commerce’. It undoubtedly slowed under the constraints imposed by eighteenth- and early nineteenth-century colonialismgiven that European colonial powers had a vested interest in restricting the movement and interaction of Asian peoples. A peripatetic population was less easy to control. The VOC archives still reflect the old world of the Nusantara. They are a rich source on inter-ethnic trading activities, as well as a fund of information on ethnic identity and social organization. One example is the 1686 list of villages, names of chiefs and households in the Priangan region of West Java. It is the oldest extant such list. The Daily Journals of Batavia Castle also frequently give lists of individual Priangan chiefs. These can help to reconstruct Sundanese identity and genealogical histories. 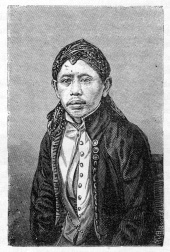 Other ethnicities like the Javanese, Madurese, Balinese and Buginese are easy to trace in the city archives of Batavia. Immigrants like the Hindu-Indians (‘gentiven’) or Muslim-Indians (‘moors’), and the Chinese also left their traces in the archives. These were usuallyin the form of requests and small-scale trading contracts. All these fragments of information can assist our analysis and create a better historical understanding of how sophisticated multi-ethnic societies functioned in the early modern period.